“O you the one in complete rest and satisfaction [toma’aneenah]! Come back to your Rabb, well-pleased and well-pleasing unto Him! Many of us have memorized these ayat by heart, but how far have we truly understood what they mean? A short reflection on these ayat has been posted, alhamdulillah. However in this particular post, we will focus on the writing of Ibn Al-Qayyim rahimahullah. verily, in the remembrance of Allah do hearts find rest [toma’aneenah]. We appoint for him a Shaitan to be an intimate companion to him. Again, the sound opinion here is that Allah’s Remembrance is that which He sent to His Messenger sallallahu ‘alayhi wasallam – i.e. the Qur’an. Whoever turns away from this, Allah will appoint a shaitan for him, who will misguide and deter him from the straight path even though the person may think that he is righteously guided. The ayah “O you with toma’aneenah! Come back to your Rabb…” therefore indicates that the soul will not return to Allah unless it is characterized by toma’aneenah. Meaning, to be eligible to be one of the righteous souls that will receive such a call from his Rabb, one needs to attain toma’aneenah first in this dunya. And for these people, there will be great happiness and a beautiful place for their final return: they will return to their Rabb, the Most High, and they will be from among His honored slaves, and they will be allowed to enter His Paradise. May Allah s.w.t. make us and our loved ones one of them – Allahumma ameen! Attaining toma’aneenah is only through the remembrance of Allah s.w.t. i.e. the Qur’an. Do not have the wishful thinking of ever achieving such high status in the Sight of Allah s.w.t. 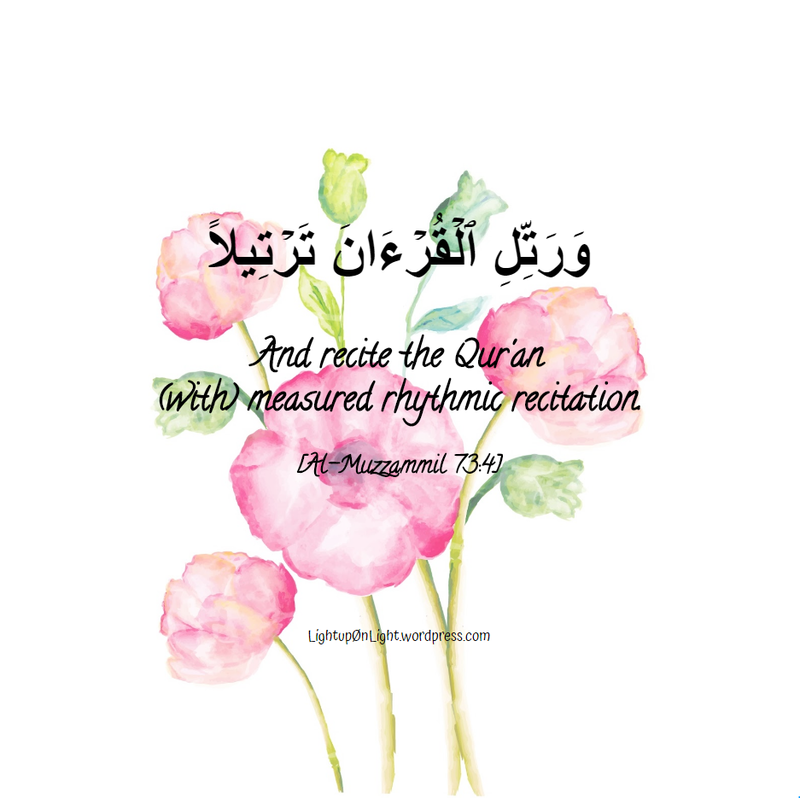 and ever receiving this prominent invitation from your Rabb if you yourself refuse to give time to ponder and study the Qur’an. And if you turn away and neglect the remembrance of Allah s.w.t. while you’re still alive, then be ready to be neglected on the Day of Resurrection. This is the most hard-hitting lesson of all, and it is a strong reminder for myself foremost. In order to attain such toma’aneenah, and all other benefits through studying the Qur’an, one of the essentials that a person must strive to learn is the Beautiful Names and Attributes of Allah s.w.t., and then apply this knowledge in our everyday lives – meaning, for example, it’s not sufficient for one to know that Allah s.w.t. is Ar-Razzaq (The Provider) yet abandons his prayers to chase sales and profits. This person has not truly understand and internalize this knowledge. This person will not be able to attain toma’aneenah, and will not be qualified as the righteous soul mentioned in the ayat above. Those who refuse to give time for the Qur’an, those who turn away from it, not only will he never attain toma’aneenah, and not only will he never be the righteous soul whom Allah s.w.t. calls out in His invitation, but Allah s.w.t. will also appoint a shaytan for him as his close companion in this dunya. He will think that he is rightly guided, he will think he is safe, yet the shaytan has already misguided and deterred him from the straight path. May Allah s.w.t. protect us and our loved ones from ever be misguided – Allahumma ameen. Ibn Al-Qayyim rahimahullah continued to write that toma’aneenah is more than tranquillity. It includes knowledge, faith and the attainment of what is known. If the slave of Allah has toma’aneenah with Allah’s Commands, then he knows that Allah’s religion is the truth and that Allah will certainly support him and is sufficient for him and his family. If the slave of Allah has toma’aneenah with Allah’s Decrees, then he knows that nothing will reach him except what Allah has already written for him. He knows that whatever Allah wishes will come to pass, and whatever Allah doesn’t wish will not not come to pass. Nothing will happen unless it is written, and if it is written, then nothing can stop it. Therefore, there should be no fear, worries, or concern for those with faith. If an adversity occurs and the believer can do something, then he should do so. However, if he cannot, then he should not be annoyed or dismayed. May Allah s.w.t. grant us all toma’aneenah. and do not rush through it like the hasty recitation of poetry. Stop at its amazing parts and make your heart move with it. and rent asunder by the fear of Allah. Such are the parables which We put forward to mankind that they may reflect. In this ayah, Allah s.w.t. emphasizes the greatness of the Qur’an, its high status and of being worthy of making hearts humble and rent asunder upon hearing it, because of the true promises and sure threats that it contains. Then if this is the case with a mountain which is hard and massive – that if it was made able to comprehend and understand this Qur’an – will feel humble and crumble from fear of Allah the Exalted, then what about you, O mankind? Why do your hearts not feel softness and humbleness from the fear of Allah, even though you understand Allah’s command and comprehend His Book? If the solid mountains feel humble and are rent asunder from the fear of Allah, if it heard Allah’s Speech and comprehended it, what about you O mankind – who heard the Qur’an and understood it? Allahumma, revive the state of our hearts! and who could not bear to hear (it). 1. They are blind to Allah’s Signs in this world, or blind to the Noble Qur’an and unable to ponder on its meanings nor benefit from its lessons and wisdom. 2. They are completely deaf to the truth of Allah’s Words and that of His Messenger ﷺ. It could also mean that they do not wish to hear it. Those who refuse to accept and follow the Sunnah of Rasulallah s.a.w. So beware o Muslims, for if we are negligent, we can fall into any of these categories as well. May Allah s.w.t. protect us and not make us one of them. For the article written in collaboration with The Ideal Muslimah and mp3 of the Ayah, please visit The Ideal Muslimah website. My wise husband once said: “Kemerdekaan yang sebenar ialah merdeka daripada mengharap kepada makhluk.” As us Malaysians celebrated Independence Day, let’s remind ourselves what true merdeka really is. and has not placed therein any crookedness. The word [Alhamdulillah] means all praise & gratitude to Allah s.w.t. for everything. But sometimes Allah s.w.t. highlights a specific matter in the Qur’an for us to reflect upon, and upon that reflection, the word that should come out from our mouth is Alhamdulillah. In this ayah, Allah s.w.t. says there is no room for any deviation in the Qur’an. What it means is that no matter how political, ideology, economy, technology, fashion, or culture changes – one thing will not change – and that is the Qur’an. Its values, principles & truth are straight and clear as how it was first revealed. So alhamdulillah, the Qur’an teaches us that we are not those who keep changing our standards when the world changes. Alhamdulillah, we are freed from slavery to fashions & trends, from wanting to become popular, from being like anyone else. Alhamdulillah, Allah s.w.t. has removed these unnecessary pressures from us. Alhamdulillah, our Deen teaches us that true merdeka is freedom from all false attachments, but to rely on Allah s.w.t. solely.